We’re now ready to build the ultimate consumer of the application, the web layer. As we said before this layer can be any type of presentation layer: MVC, a web service interface, WPF, a console app, you name it. The backend design that we’ve built up so far should be flexible enough to support either a relatively simple switch of UI type or the addition of new types. You may want to have several multiple entry points into your business app so it’s good if they can rely on the same foundations. Otherwise you may need to build different apps just to support different presentation methods, which is far from optimal. In short the Web API is a technology by Microsoft to build HTTP-based web services. Web Api uses the standard RESTful way of building a web service with no SOAP overhead; only plain old HTTP messages are exchanged between the client and the server. The client sends a normal HTTP request to a web service with some URI and receives a HTTP response in return. Routing example: say that the client wants to get data on a customer with id 23. They will send a GET request to our web service with the following URI: http://www.api.com/customers/21. The Web API routing engine will translate this into a Get(int id) method within the controller called CustomersController. If however they want to delete this customer then he will send a DELETE request to the same URI and the routing engine will try to find a Delete(int id) method in CustomersController. In other words: the supported HTTP verbs have a corresponding method in the correct controller. If a resource does not support a specific verb, e.g. a Customer cannot be deleted, then just omit the Delete(int id) method in the CustomersController and Web API will return a HTTP exception message saying that there’s no suitable method. The basic convention allows some freedom of naming your action methods. Get, Post etc. can be named Get[resource], Post[resource], e.g. GetCustomer, PostCustomer, DeleteCustomer and the routing will still work. If for any reason you don’t like the default naming conventions you can still use the standard HttpGet, HttpPost type of attributes known from MS MVC. 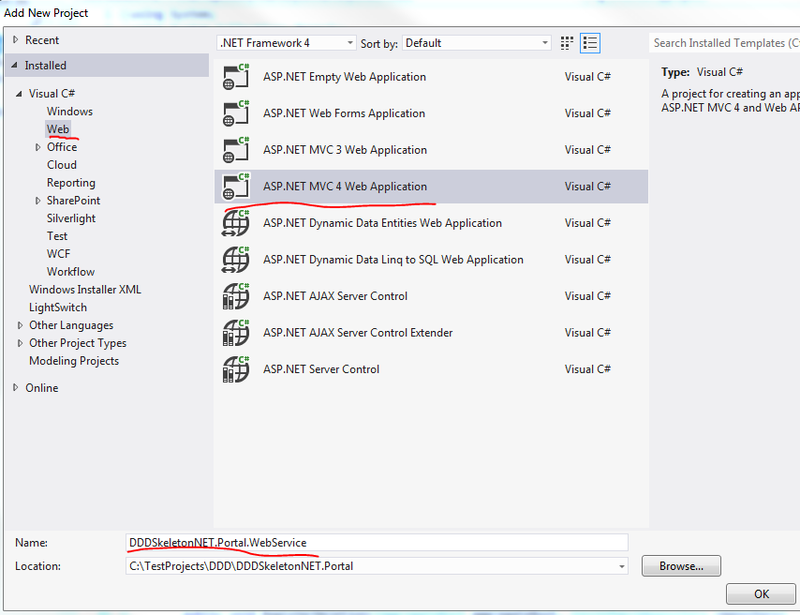 I won’t concentrate on the details of Web API in this post. If there’s something you don’t understand along the way then make sure to check out the link provided above. However, at some point we’ll need to inject these dependencies, right? We could follow poor man’s DI by constructing a new CustomerRepository and a new InMemoryUnitOfWork object as they implement the necessary ICustomerRepository and IUnitOfWork interfaces. However, modern applications use one of the many available Inversion-of-Control containers to take care of these plumbing tasks. In our case we’ll use StructureMap which is quite common to and works very well with .NET projects. IoCs can be difficult to grasp at first as they seem to do a lot of magic, but don’t worry much about them. StructureMap can do a lot for you without having to dig deep into the details on how it works as it’s easy to install and get started with using NuGet. 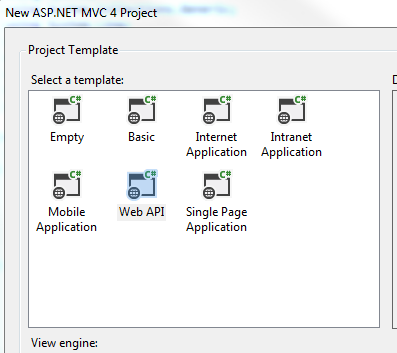 Add a new Web API project by taking the following steps. We’ll need to have an ICustomerService object in the CustomersController so add a reference to the ApplicationServices layer. We’re extending the HttpRequestMessage object which represents the http request coming to our web service. We build a response based on the Response we received from the service layer. We assume that the http status is OK (200) but if there’s been any exception then we adjust that status and throw a HttpResponseException exception. Make sure to set the namespace to DDDSkeletonNET.Portal so that the extension is visible anywhere in the project without having to add using statements. Here we maintain a dictionary of Exception/HttpStatusCode pairs. It would be nicer of course to read this directly from the Exception object possibly through an Adapter but this solution is OK for now. We ask the service to retrieve all customers and convert that response into a HttpResponseMessage object. StructuremapMvc was auto-generated by the StructureMap NuGet package and it can safely be ignored, it simply works. DependencyResolution folder: IoC.cs is important to understand, the other auto-generated classes can be ignored. In IoC.cs we declare which concrete types we want StructureMap to inject in place of the abstractions. If you are not familiar with IoC containers then you may wonder how ICustomerService is injected in CustomerController and how ICustomerRepository is injected in CustomerService. This is achieved automagically through StructureMap and IoC.cs is where we instruct it where to look for concrete types and in special cases tell it explicitly which concrete type to take. StructureMap follows a simple built-in naming convention: if it encounters an interface starting with an ‘I’ it will look for a concrete type with the same name without the ‘I’ in front. Example: if it sees that an ICustomerService interface is needed then it will try to fetch a CustomerService object. This is expressed by the scan.WithDefaultConventions() call. It is easy to register new naming conventions for StructureMap if necessary – let me know in the comment section if you need any code sample. We also need to tell StructureMap where to look for concrete types. It won’t automatically find the implementations of our abstractions, we need to give it some hints. We can declare this in the calls to scan.AssemblyContainingType of type T. Example: scan.AssemblyContainingType() of type CustomerRepository means that StructureMap should go and look in the assembly which contains the CustomerRepository object. Note that this does not mean that CustomerRepository must be injected at all times. It simply says that StructureMap will look in that assembly for concrete implementations of an abstraction. I could have picked any object from that assembly, it doesn’t matter. So these calls tell StructureMap to look in each assembly that belong to the same solution. There are cases where the standard naming convention is not enough. Then you can explicitly tell StructureMap which concrete type to inject. Example: x.For()[abstraction].Use()[implementation]; means that if StructureMap sees a dependency on ‘abstraction’ then it should inject a new ‘implementation’ type. ObjectFactory.AssertConfigurationIsValid() will make sure that an exception is thrown during project start-up if StructureMap sees a dependency for which it cannot find any suitable implementation. StructureMap couldn’t resolve the IUnitOfWork dependency so it threw an error. …and press F5. Execution should stop at the break point. Hover over _customerService with the mouse to check the status of the dependency. You’ll see it is not null, so StructureMap has correctly found and constructed a CustomerService object for us. Step through the code with F11 to see how it is all connected. You’ll see that all dependencies have been resolved correctly. The ‘ObjectContent`1’ type failed to serialize the response body for content type ‘application/xml; charset=utf-8’. This will make sure that we return our responses in JSON format. This is the message we set in the code if you recall. You can decorate the Response objects as well with these attributes. This was a little change in the property names only but feel free to add extra formats to the view model, it’s perfectly fine. We’re missing the insert, update and delete methods. Let’s implement them here and we’ll test them in the next post. We’ll test these in the next post where we’ll also draw the conclusions of what we have achieved to finish up the series. This series is awesome.Thank you very much. Thank you for this great serie! I know that repositories and services should not expose the IQueryable because of the abstraction leak, right? And it would be totally wrong way. But, you know if there is some way to enable odata attribute on the actions of ApiController without harm the domain concept of the services? This might be a “technology-driven” thought, but would help a lot in things like paging and ordering of third party data grids, for example. Hi Daniel, thanks for your comments. I’m not too knowledgeable on OData to answer properly. However, with the current setup in the demo the only way to have OData queries without exposing the repository seems to be to parse the query somehow and translate it to service methods instead. Thanks for the GREAT Practical Series on DDD, cleared most of the concepts but one question here is where is the domain service? There’s no need for domain services in this demo as the domain layer is still very thin. All logic is encapsulated within the domain objects. I’ve been working thru this series today and also the WebApi 2 series yesterday. Both are great and give me a lot of potential ideas of changing my current implementation of DDD which I created based on the ideas from the Jimmy Nilsson book, Applying Domain-Driven Design and Patterns. My only suggestion for this series is to update this particular article to reflect the newer WebApi 2 instead of the older VS 2012 MVC 4 and code dealing with HttpResponseMessage and the helpers. Make these changes and you still have a series that stands the time test for awhile longer. I’ll be working on a new, updated DDD series this summer which will certainly have a Web API 2 interface. I’ll therefore leave this series untouched. Great series of article Andras, thank you for your time and sharing extensive knowledge. I would like to ask that how do we separate User Authentication (login/registration etc.) issues on MVC? Infact I could not decide how to separate especially newly supported Identity Models in ASPNET Identity framework with this approach, any comment would be appreciated. I cannot answer fully in a comment field but have you looked at the series on MVC5 authentication?